Fall and winter are my favorite seasons for several reasons: boots, homecoming, holidays and cold weather, just to name a few. While many complain about the cold, I love it because it means that I no longer have to worry about sweating all my makeup off. Also, being able to wear cozy sweaters is just an added bonus. I take full advantage of the winter to play up my eyes as much as possible, because let’s be honest, we don’t tend to wear heavy eyeliner and mascara in the summertime. Whether you’re a fan of the cat-eye look, or just a lightly lined eye, here are some of hottest eyeliner trends to try out this season. 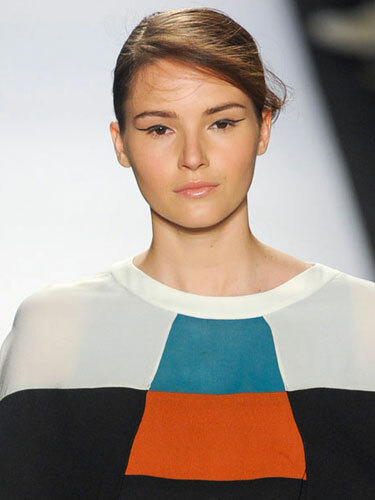 The winged eye was one of the most popular during New York Fall Fashion Week. Designers from BCBG to Altuzarra experimented with this look, deeming it one of the top trends to look out for this season. Liquid is the best way to achieve this look, and I would suggest either Covergirl’s LineExact Eyeliner (Target, $6.24) or Yves St. Laurent’s EYELINER EFFET FAUX CILS SHOCKING - Bold Felt-Tip Eyeliner Pen (Sephora, $32). These pen-like eyeliners make for easy application and last all day. Rimmed eyes, or completely lining both the top and bottom of the eye, has also been a noticeable trend this year. Black is definitely the way to go with this look; save the colors for another day. You can be bold and thicken the line for a smoky look, or keep it classic. Try L’Oreal Paris Voluminous Smoldering Eyeliner (Target, $7.94) or Stila’s Convertible Eye Color, which has a liner on one end and a smudging tool on the other (stilacosmetics.com, $22). If you’re looking to have some fun with color, try experimenting with different earthy tones, such as greens, browns, dark blues and deep violets. These colors will allow you to mix it up, but keep you from looking too over-the-top. For a complete set of colors, go with Urban Decay’s Ocho Loco 24/7 Glide-On Eye Pencil Set (Sephora, $59) or choose one color from the Milani Color Brillance Eyeliner Pencil Collection (Target, $4.49). The key to rocking this trend is to keep it as subtle possible; this look could go from pretty standout to 80s workout in a matter of one simple stroke. Try only lining the bottom of your eye in a soft bronze or silver and keeping the rest of your makeup as natural as possible. My favorite is either Nars Soft Touch Shadow Pencil (Sephora, $24) or Almay Wake Up Eyeliner + Highlighter Automatic Pencil (Walgreens, $8.99). To keep your eye makeup from smudging, you’ve got to get e.l.f. Studio Eye Primer & Liner Sealer (eyeslipsface.com, $3). Seriously, it’s only $3, and it’s one of my go-to products. You won’t regret it. Never, never, never forget to remove your eyeliner/ makeup before going to bed; leaving your makeup on overnight not only has bad effects on your skin, but also makes your eyes look tired the next day. For easy removal, I love Neutrogena Makeup Remover Night Calming Wipes (Target, $6.49).